Woohoo, I've made it! A whole year! Today, exactly 365 days ago, I ventured into the world of exercise. Countless of hours, sore muscles and gallons of sweat later, I'm still standing, taller and stronger than ever before. But this blog post is not just about me boasting about my success, even though I'm very proud of my achievements. It's about how sticking to one single decision can change a life. It might sound cheesy, but I'm dead serious. And it's not so much a cliché as it is a modification of a cliché. You have probably heard it a million times (in all aspects of life) "you just need to make a decision". But is that the whole truth? There are millions of people around the world who make the decision to live a healthier life... every Monday. The challenge is sticking to your decision, not just to make it. It's January and the gym is PACKED! Some faces I know, from seeing them every week. Some faces I recognize from January/February last year. Many faces are completely new. You can recognize the beginners by the look of pain in their faces. I know it's an up-hill struggle, believe me, I can relate. But once you're up the hill, you get to enjoy the view and the view can be spectacular. What I really want to say, to those new to exercise, is "hang in there". Tough it out! But most of all, be patient. It will get easier. And before you know it, you will be the one surprised by your own reflection. I didn't suffer through any diets, I've eaten healthier and smaller portions but not deprived myself of anything. I can proudly say I've lost 8 inches (20 cm) around my waist and 35lb (16 kg) since January last year. 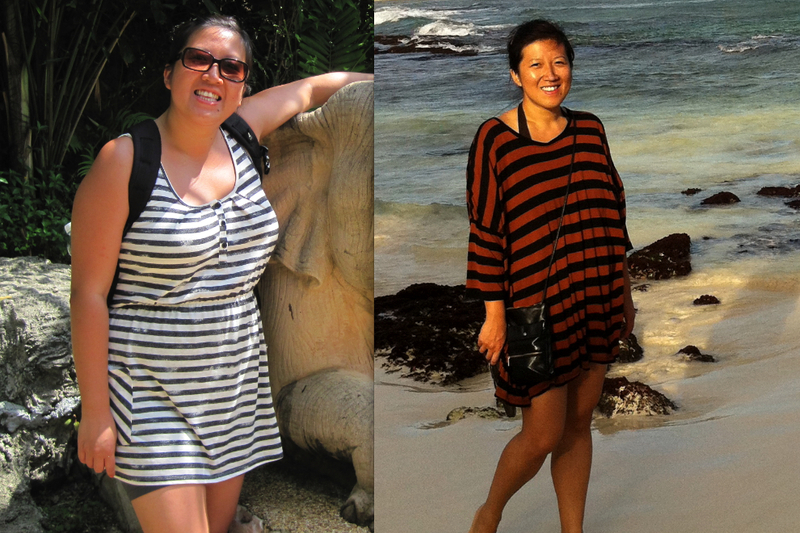 As a final note, here are pictures taken from my vacations to Thailand and Mexico, exactly one year apart. Today is NewYear's Day. The first day of the new year. I can't say I feel like any different or that the world around me has changed. However, today is a good day for contemplating on the year past and the year to come. I'm still writing you from Mexico. It's our last day in this amazing country and tomorrow we will fly back to reality. The days in Cancun have been at times relaxing and at times very hectic (as has the entire vacation). More scuba diving (with some very interesting characters), golf-cart driving, ferry rides, loooong walks, crazy bus rides, suntanning, eating and drinking. This vacation has been everything I could have hoped for and it is with a humble heart and a full stomach I have to bid farewell. All the great things aside, the most amazing thing with this trip is that I got to experience it together with my BFF. And thinkig back to the beginning of 2011, we had the privilage to explore Thailand together. We live on two different continents but with hard work, planning and prioritizing, we have done amazing things together and will continue to do so in the future. I can't wait! 2011 was a great year. My husband is great, my family is great and my friends are great. With all this, how can a year turn out anything but great? I got to start 2011 in Taiwan with my family, continue on to Thailand with my BFF, enjoy New York, Portland and Seattle with my husband, travel to Sweden, see our friends families grow, be visited by old friends from all over the world and make new friends I very much look forward to spend more time with. On top of it all, I got to discover new passions in drawing and scuba diving. But in the grand scheme of things, I will look back on 2011 and remember two things in particular. 2011 will always be the year I received my Green Card and it will always be the year I changed my life around and became a healthier, fitter and slimmer version of myself. What about the future? My hopes and plans for 2012 are very exciting. I'm not the one to promise before I know I can deliver, but I do invite you to join me in what could possibly be the most important year to date, but you will have to be patient. I also hope my loved ones will stay happy and healthy and that the small health scares we've had in 2011 is left behind, where they belong. The years may change, but my new year's resolution stays the same. I promise, a year from now, I will look back on 2012 and have had a great year.